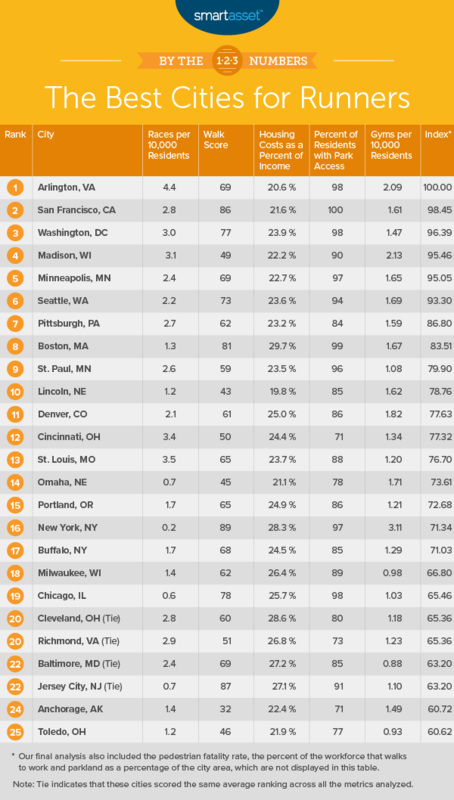 Whether you're a newcomer to the world of running or a consistent marathoner, there's new data on cities throughout the United States deemed "best for runners." SmartAsset , a financial company, released its third annual study, which shows nine of the top 10 cities from 2018 held their positions in 2019. That makes Lincoln, Nebraska the only newcomer to the list, which was ranked 12th last year . Runners love their sport for different reasons. For some, it's the community formed when running with people of similar goals. For others, improving health outcomes, like decreased heart disease and improved mood , is incentive enough. Running is a bone strengthening activity as well as a cardio workout. See the full list of cities below.